These cinnamon rolls are fast, easy, and delicious, especially when they’re slathered with homemade cream cheese frosting and on the table in under an hour. What are you to do on a Saturday morning when you have a taste for fresh cinnamon rolls (with cream cheese frosting), but you don’t want to wait three hours for a traditional roll to rise and bake? I found myself in this predicament and began scouring the Internet. The goal? Find an easy cinnamon roll recipe that takes under an hour to make with ingredients that I already have on hand. What this recipe ISN’T: This is definitely not the same as your traditional yeast cinnamon roll. While it is quite delicious and super quick to make, don’t expect it to be the same, otherwise you’ll be disappointed. There’s a place for traditional cinnamon rolls, and there’s definitely a place for this quick one too. 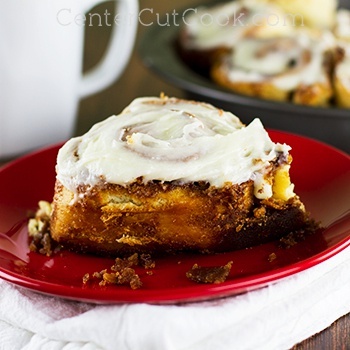 These cinnamon rolls would not be the same without a delicious cream cheese frosting which compliments them perfectly. Enjoy! You will need a total of around 8 tablespoons of unsalted melted butter, divided for different portions of this recipe. Make it easy on yourself and melt it all at once before you start. Melt 8 tablespoons of butter which you’ll use throughout this entire recipe (1 minute in the microwave does the trick). Brush a 9 inch cake pan with 1 tablespoon of butter to coat bottom and sides. Combine buttermilk, melted butter, and vanilla in a small bowl. Add liquids to the dry ingredients and mix well. You may need to add a little more flour until you get a consistency that’s not too sticky. Knead the dough until it is smooth. In a bowl combine all of the ingredients for the cinnamon sugar filling, then add 1 tablespoon of the melted butter and mix it in until it is crumbly. Flour your work surface and roll the dough out into a 12 by 9 inch rectangle. Brush the dough with a tablespoon or two of butter. Sprinkle the cinnamon sugar mixture on top leaving a 1/2 inch border around the edge. Gently press the mixture into the dough. Begin rolling the dough up starting with the longer side. Roll tightly so that the yummy cinnamon sugar mixture stays inside the roll while it bakes. Once the dough has been rolled up tightly, cut into 8 equal pieces and place into your greased cake pan. While rolls bake, mix together the cream cheese frosting ingredients until smooth. When the cinnamon rolls are done baking, let them cool for about 5 minutes. Remove from the pan, and slather with cream cheese frosting.